Single Bottle Price - £45.00. This rosé is a faithful variation of classic Pommery Brut Royal created through the assembly of a red wine made with this in mind, and different wines vinified in white, within a greater proportion of Chardonnay. Very subtle rosé character: supple and finely robust with and appealing freshness and liveliness. Drinking occasions: Exuding unusual charm, suitable as an aperitif, perfect with poultry and shellfish and with a dessert of red fruits. This fine and fruity champagne is distinguished by its fleshy note whole remaining lively, fresh and highly subtle. A very pale and delicate Rosé. A blend of rosé and Pinot Noir of Bouzy Grand Cru. Its colour comes from Pinot Noir grapes, specially picked in the vineyards for their maturity, and slightly “fermented in their skins”. 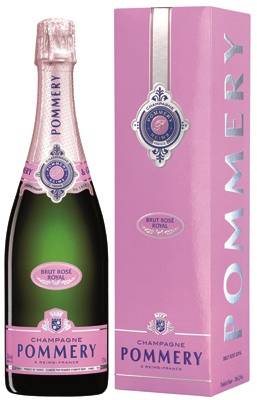 This champagne is stored in a cellar for three years to develop the distinctive properties of Pommery Rosé. Cheerful during the day, romantic in the evening.